The hulking Dark Knight seen in Batman v Superman: Dawn of Justice. Features exquisite articulation and detail, plus interchangeable hands and accessories. Measures 10-inches tall and includes an action figure display stand. The hulking Dark Knight seen in Batman v Superman: Dawn of Justice is recreated in this terrific 10-inch tall plastic action figure. Square-Enix has carefully contrasted the hard metallic edges with flowing organic details of cloth-like texturing on the cape. Tiny nicks, scratches, and weathering on the armor show the Dark Knight's battle scars. This Batman v Superman: Dawn of Justice Armored Batman Play Arts Kai Action Figure's eyes are painted with a pearlescent paint, making them almost glow. The deep emotions springing from beneath his heavy armor can be expressed through a wide range of action poses. With so much articulation, you'll say, "Holy joint movement, Batman!" 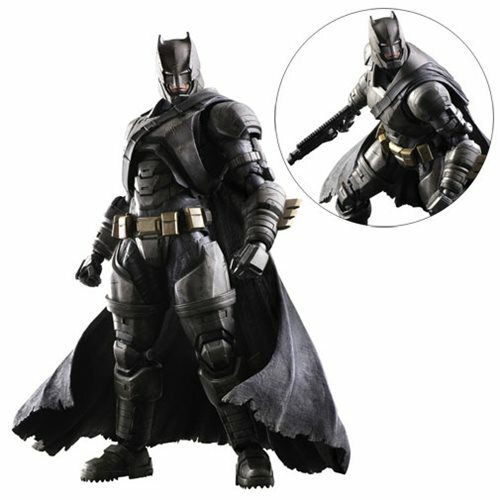 The Caped Crusader is well prepared, with accessories that include a grenade launcher and various interchangeable hand pieces, as well as a figure display stand. Ages 13 and up. In the film, Bruce Wayne creates an armored suit, assembling the full might of mankind's technology and shoring up the strength of Earthlings against the might of the powers of the alien Superman.